Back in January of this year, we were in Auto Expo and that was the place where Mr. Shinzo Nakanishi, MD, Maruti Suzuki, confirmed about a new and contemporary replacement of Alto and 800. Well, rumors regarding the possible time of launch this replacement was floating around lately. 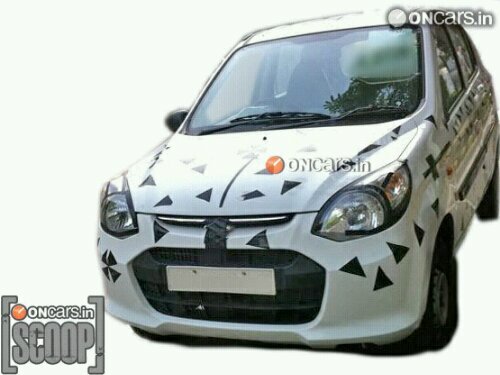 Now the sleuths at ONcars.in have managed to snap the pictures of the upcoming car that was on test. Design of the car is new and fresh, but somehow it resembles i10 and i20 at so many points. The vehicle that were caught on test was a LXi variant, as we see that badge on the boot-lid. Let’s sum up the details that we make out of the photographs. Newly designed headlights and swept-back tail lamps. Decent looking boot-lid unlike A-Star or Swift. Very small front grille with a single chrome-lining insert with the Suzuki logo at the middle. Side profile of the car looks good and mascular with the improved curves and shoulder-lining, ending at the tail lights. Height of the car is better than Alto but not a Tall-Boy design. The engine is expected to be a new 800 cc Petrol Mill, complying recent emission norms. Recently Maruti Suzuki admitted that Alto is facing serious fall in sales, one of the primary reasons being the petrol price. So, we hope that this replacement will bring fame to Maruti Suzuki. Though a diesel variant of this same car could make it best-seller, just like Alto. So let’s wait and see. As of now, none of us have any clue regarding the name of the car, but as soon as we become aware of it, you’ll be updated with every information available. So stay tuned!